I'm definitely more a sneakers/boots person. My last kicks I wore to death for a year and a half before it gave out. So I decided it was time for some new ones, apart from the fact that wearing stiff boots most of the time has earned me the nick name - tomb raider, which I don't necessarily mind. It was time to switch it up a bit and wear something a little more comfortable. I wanted some platforms because I can't find creepers that fit me, and aren't terribly overpriced and I needed some new sneakers. Then I found this cool looking one. Zipper on the side. Platform that looks about 2 1/2 inches. Cool studs and mixed outer fabrics. YES YES YES (I could do without the striped sole though) So I placed an order and waited for 2 business days when it got to my doorstep. Honestly. It looked better online. First of all, I had to change the laces to white because black on black, especially on this one didn't look good, and kinda made my feet look wide and sausage-y. Second the "platform" wasn't a platform at all, the sole seemed standard to me, maybe .3 cm taller. 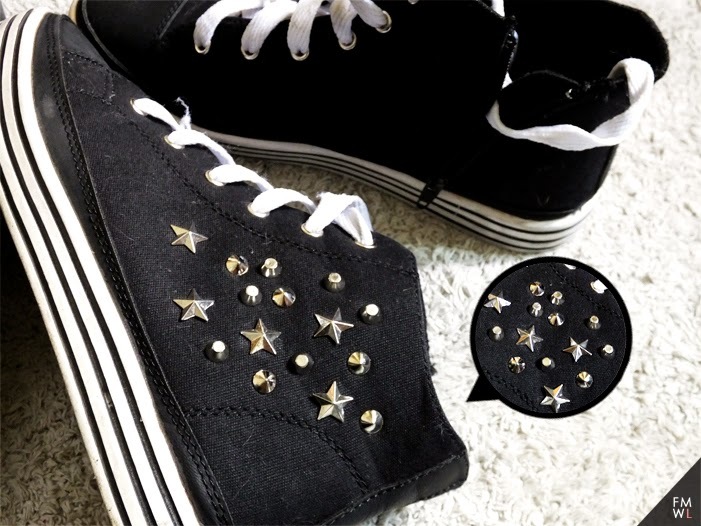 Thirdly, the star studs while it looks sturdy are actually flimsy. One of them almost came off when it snagged on the fabric of my chair. It does have its good points. It feels and looks sturdy. The stitching is well made and the faux leather accents look good, despite being faux leather (not the biggest fan). The other type of stud is fastened or bulleted(?) really well unlike the star one. The zipper on the inside feels sturdy and works well enough. Is the price justifiable? Not really. I can definitely pay a couple hundreds more to get a more decent good brand shoe. But I like it. I'm not ecstatic, but I'm not cursing it either. Can we just take a moment to appreciate the lengths Zalora goes to package their items real nicely? The printed box, personalized sticker for names, item break-down and FREE return policy are just outstanding to me and unprecedented in terms of online shopping experience.